Europe sure loves its history. This may be related to the fact that they’ve got a lot more of it than we do. Or you could argue it is because their best days are behind them. Regardless, with fourteenth century castles, old city centers and beautiful architecture dotting the countryside, it is no wonder history is so revered there. While the entire continent operates this way, perhaps no one city is more obsessed with history than Salzburg, Austria. This epicenter of nostalgia gets its very identity from three seminal events. Three things rooted in history that took place in the 1756, the early 1800s and the 1960s respectively. These events starkly define not only Salzburg’s past, but very much it’s present. 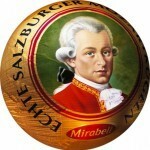 In a city where you can’t get a glass of ice water without carbonation, you can easily buy Commemorative Mozart memorial chocolates in every store in town. And those stores line streets that are packed with bus traffic alternatively schlepping tourists between the salt mines and the various points of interest related to the Von Trapp Family Singers. The city is obsessed. Case in point, the television in our Salzburg hotel room received a grand total of two channels in English. BBC America was one, and the other was The Sound of Music playing on a continuous loop. Yes, that’s 24 hours a day of curtain clothes, Rolf the dirty Nazi and vocal lessons from Mary Poppins. A quick walk into the old town of Salzburg revealed scores of tourists madly snapping photos as they channeled their inner Liesl; dancing on artifacts from the film that were literally crumbling beneath them. It was interesting, but at the same time sad. Salzburg, a once-proud world power, has its identity firmly rooted in a decaying past and seemingly no real plan for the future. The lesson for my own life hit hard. Do I want to be stuck in the past; clinging to my history, playing old tapes and reminiscing about the good things I’ve done while growing bitter about the bad? Or do I want to be future-focused and driving toward a better destination? The choice is too obvious to require enunciation. But being obvious isn’t the same as being easy. While we can easily recognize that regret is for suckers, avoiding a Salzburg mindset requires some serious work. Put in the effort. Get counseling, get on, and get over. We’ve all experienced and done things good and bad that have impacted us. We’re hopeless sinners who have done wrong and been wronged. It can’t be changed but it can’t continue to haunt us. Assess the mistakes you made and how you can adapt for the future. Enjoy your accomplishments, but go out and add some more. We need to be diligent about focusing on growth, learning, forgiveness and healing. God can’t drive a parked car, move forward!